I’ve been working on this drawing for three weeks now. Every one of us is in the same boat, sight-sizing a drawing from a plaster cast. Finally, this week, I felt comfortable enough with my measurements to put in some lines and move forward. My measuring skills continue to improve. What I haven’t done yet is the value scale for this drawing. That will be the first thing I do next Thursday when I get to class. Over time, as you learn a new skill, you also become familiar with different or better materials. Now that I’ve been working with charcoal and cursing it’s mother in as many languages as I can think of (thankfully not many…) I finally found a working charcoal called Nitram that is AMAZING. https://nitramcharcoal.com/ It is used in place of vine charcoal. I was curious what the big deal was, and it is a big deal. This is where you see me doing the Snoopy happy dance! I just might be a charcoal convert, but the jury is still out. Perhaps I’m just being stubborn! Nitram is available from different art supply stores as well as Amazon. If you haven’t tried it, do! It is a life-changing drawing tool. One of Rod’s sketches, illustrating Bridgeman’s use of stacked boxes, and a gesture/mass drawing. His favorite resource is Bridgeman, and you can tell from the blocks above. (For additional information please check out “The Best of Bridgeman” by Dover publications.) Rod uses the blocks to understand the shape, mass, and angles of the head and torso. I’ve worked with Bridgeman illustrations before, although having the explanation from Rod about how to use these images makes so much more sense than trying to figure it out for myself. Bridgeman is almost all illustrations with little to no text. Here’s an example from my practice sketches out of the Bridgeman book. 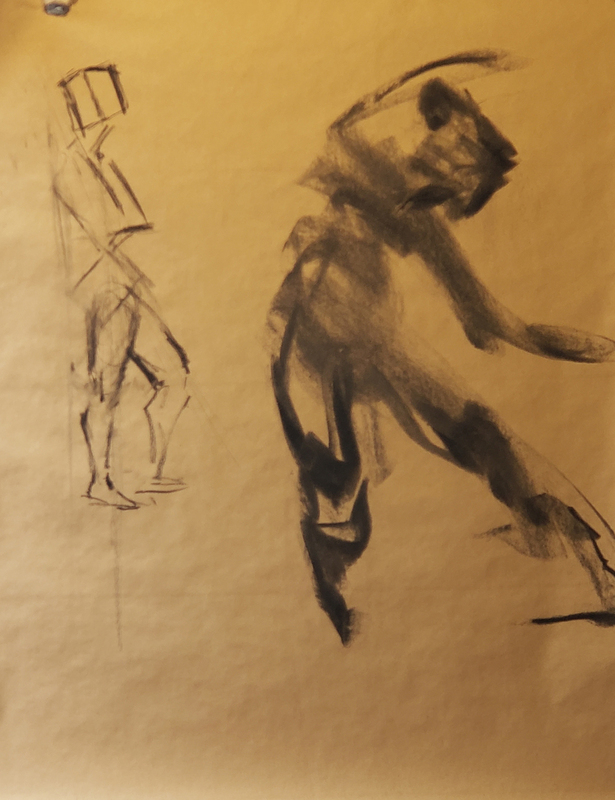 Rod Cameron is a very nice guy, and hugely knowledgeable about figure drawing and art. Apparently, he rarely teaches, and it was suggested to me that if he did, I needed to take his class, and so I did. We had maybe 7 students in this class and we were all able to get plenty of feedback from him. 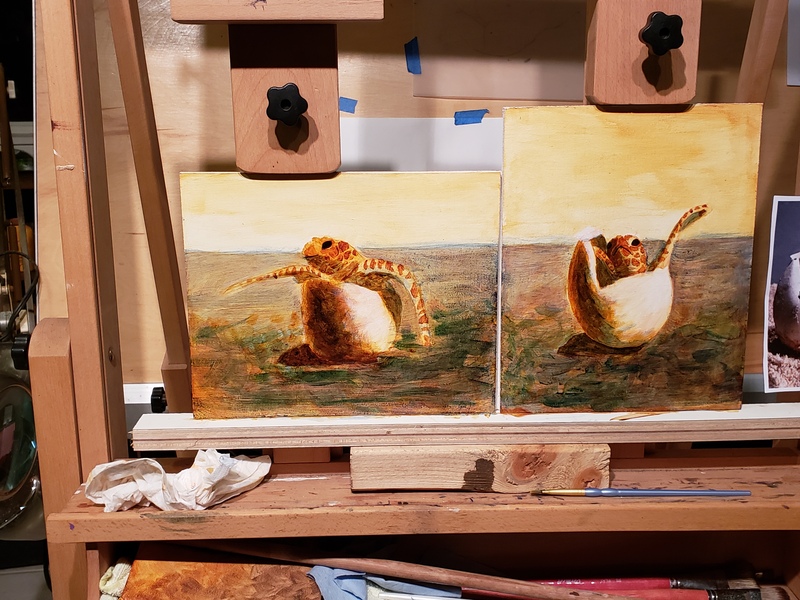 After each couple of poses, he would come around and look at our work, complimenting what he liked about it and suggesting changes to make it better. 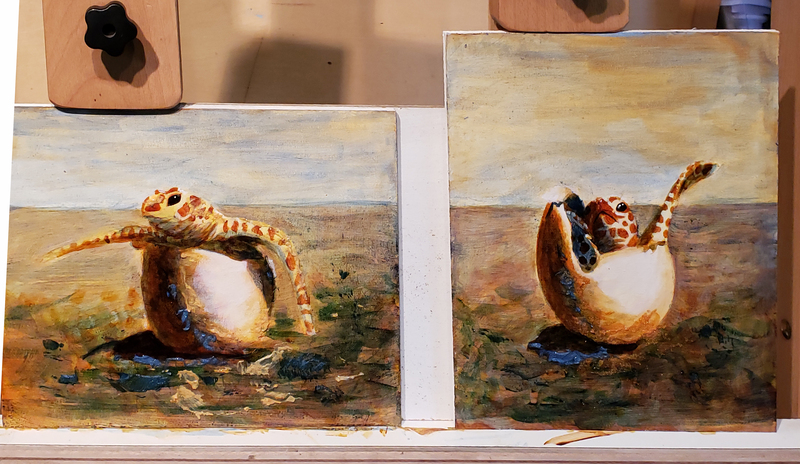 I figured out part way through the class that I was the student with the least amount of experience, based on the drawings that I saw taking form. It has been a long time since I’ve worked from a live model and those skills were mighty rusty. It was a great challenge and a fabulous learning experience. Thank you, Rod Cameron, and Kipaipai Art for hosting the workshop. Where to set up. if you want a straight-on model, set up in the middle. (Much of what I was drawing was a ¾ view and angled to boot because the model was on a stage). Have your basic figurative information down cold. 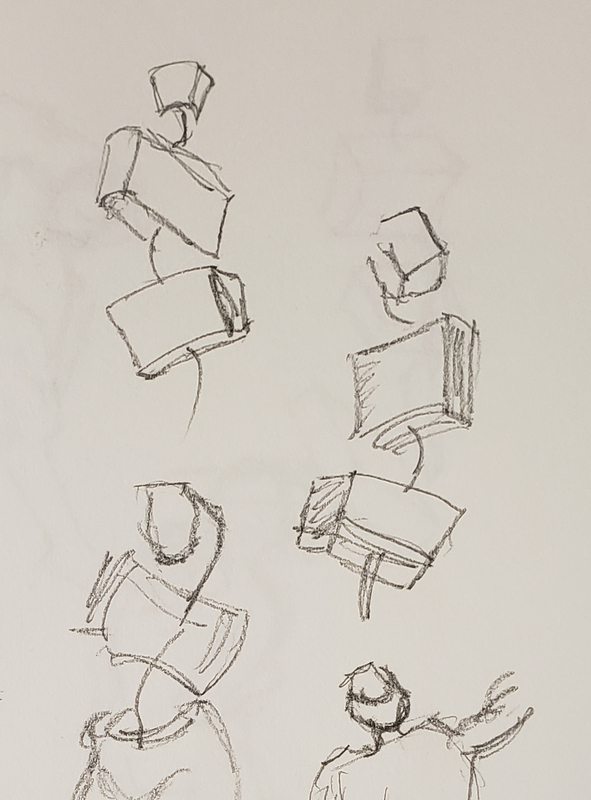 I spent much of my time referencing my notes on how many heads made up the length to the bottom of the torso, how long legs are supposed to be, etc. I need that information memorized so that I can focus on the drawing and not on remembering something I should already know! What type of charcoal to use. For these quick sketches, vine charcoal is best, and Rod was using these fat sticks of it. Something I just haven’t seen. White Board. Rose Adare (my Atelier instructor) had a great suggestion, use a whiteboard with a marker. When you’re done with a sketch, erase it and start over. If you like it, take a picture! The whole idea is that this is just practice. This was about developing hand/eye coordination and skills on the fly. This was a test of what I know intrinsically, and what I still need to internalize for information about the figure. This was a great reminder that I have to practice drawing larger images. Use large paper!!! 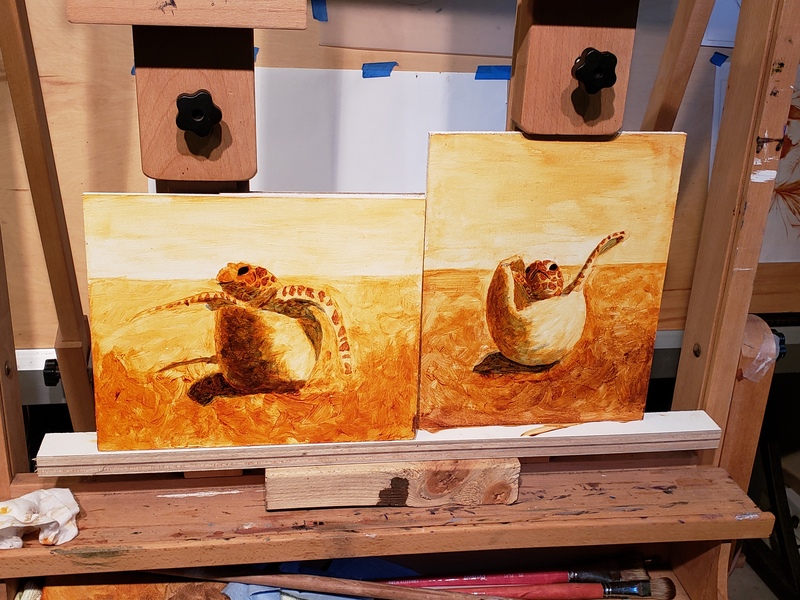 I focus too much on the small, and it is important to focus on whole arm movements since this is what brings grace to an image or a figure that you are drawing. Don’t forget to stand back and look at your drawing regularly. This will point out the flaws in your work quickly. You can also use a mirror or a camera on your phone to accomplish the same task. This was also a great reminder that I can’t let my frustration get the better of me. When I get frustrated my lines get REALLY DARK. (Let’s call it passionate, shall we?) I was definitely out of my comfort zone, and that is a great thing. Embrace it and learn from it. Based on what I have here, I’d say I learned a great deal from this workshop. I have to practice drawing with light lines. That way I will have room for emphasis in my drawing later. Light lines are also much easier to correct! 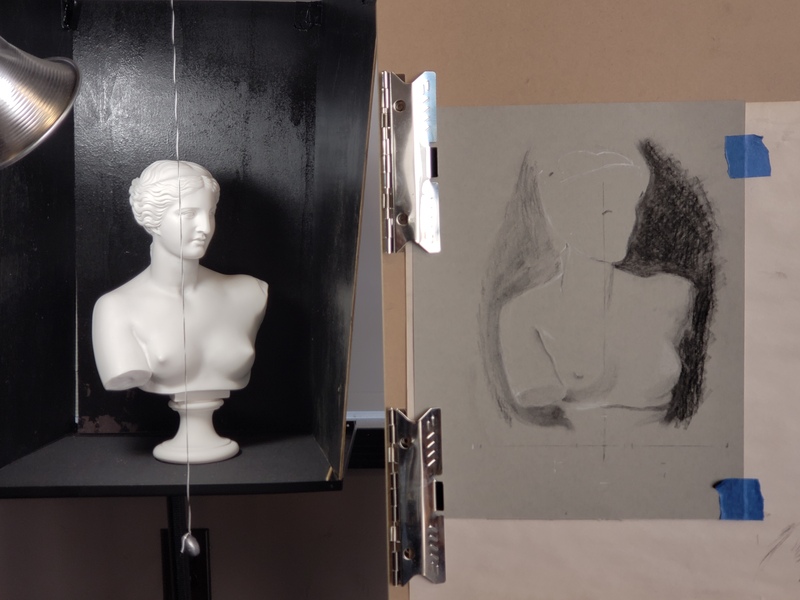 If you’re thinking about taking a figurative drawing class, keep these tips in mind!